Part 18: Calculating the 4D number tau it’s inverse in a very simple way. It is the shortest day of the year today and weirdly enough I like this kind of wether better compared to the extreme heat of last summer. Normally I dislike those long dark days but after so much heat for so long I just don’t mind the darkness and the tiny amounts of cold. 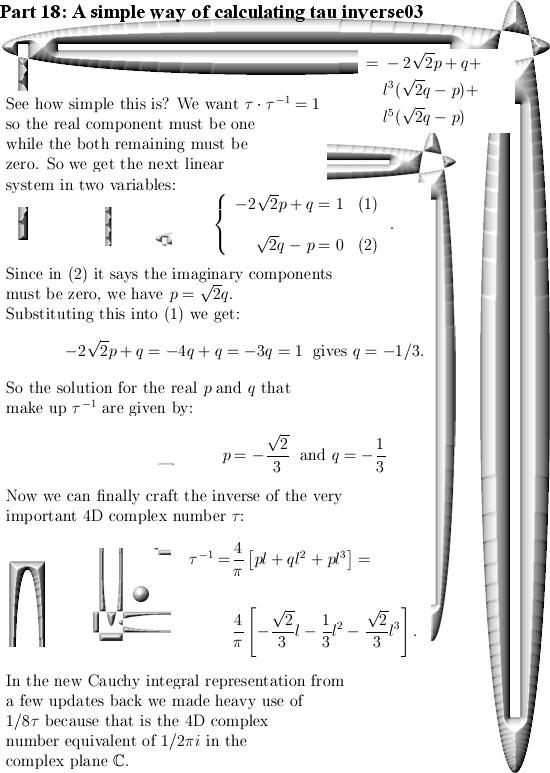 In the previous post we found a general way of finding all inverses possible in the space of the 4D complex numbers. 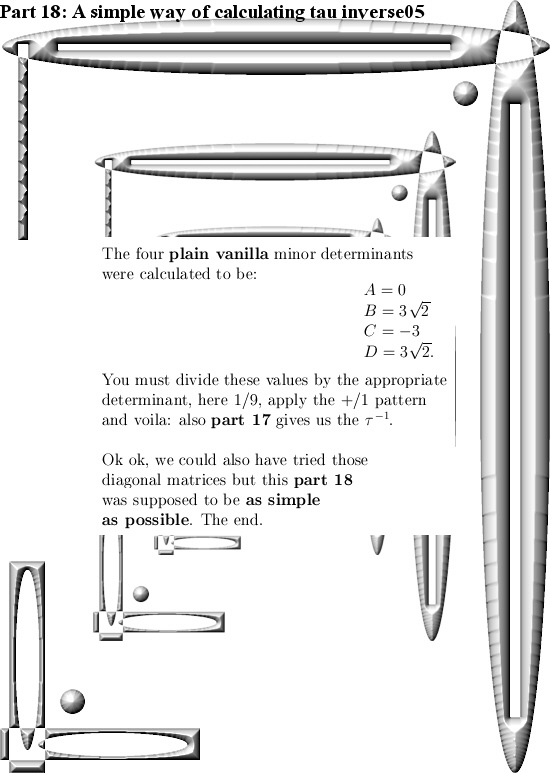 Furthermore in the post with the new Cauchy integral representation we had to make heavy use of 1/8tau and as such it is finally time to look at what the inverse of tau actually is. I found a very simple way of calculating the inverse of the number tau. It boils down to solving a system of two linear equations in two variables. 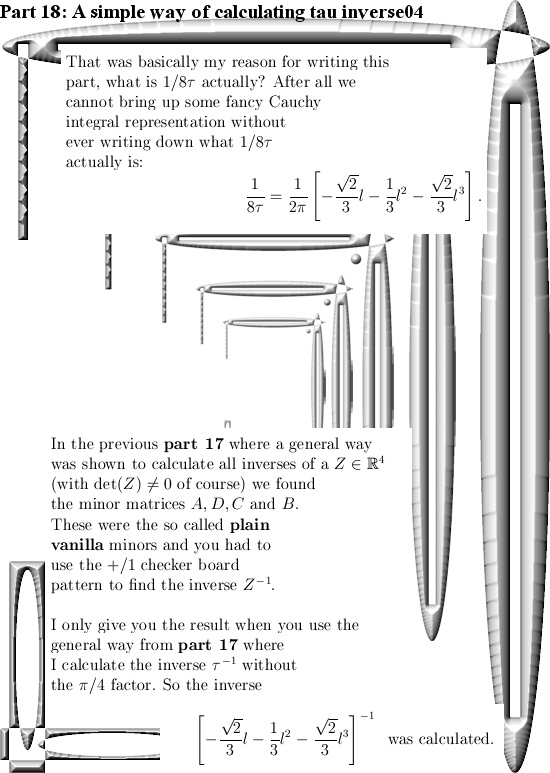 As far as I know reality, most math professionals can actually do this. 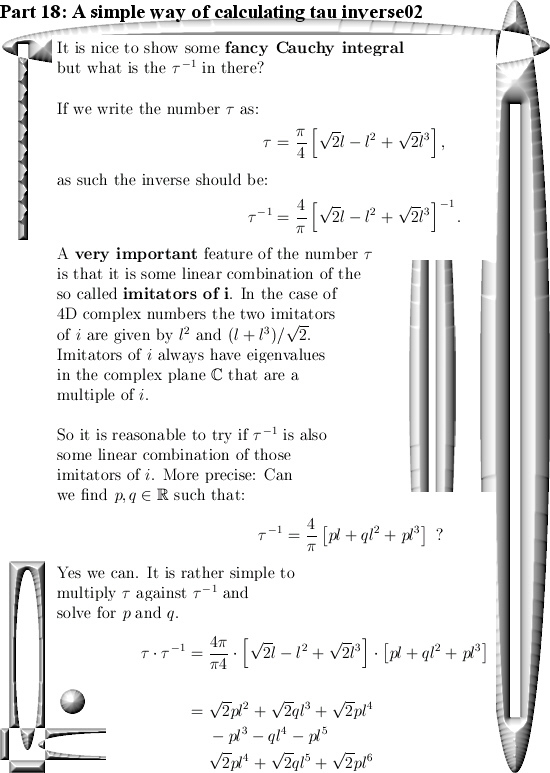 Ok ok, for the calculation to be that simple you first must assume that the inverse ‘looks like’ the number tau in the sense it has no real component and it is just like tau a linear combination of those so called ‘imitators of i‘. This is a short post, only five pictures long. 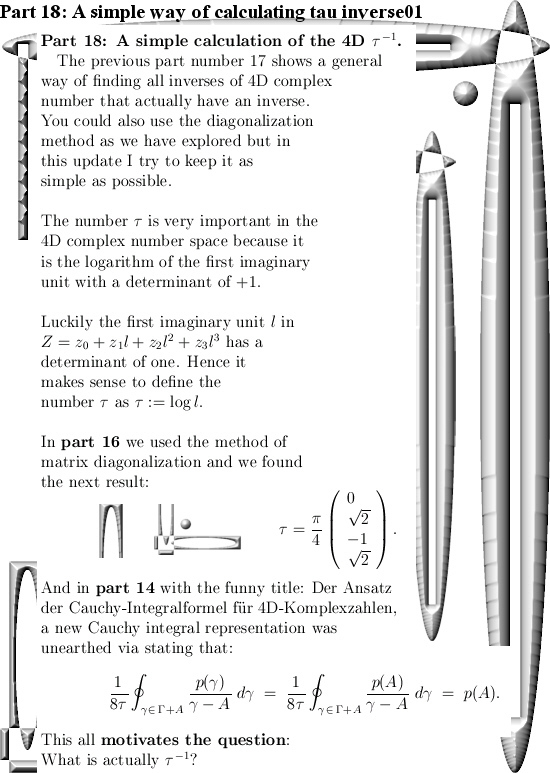 I started the 4D complex number stuff somewhere in April of this year so it is only 8 month down the timeline that we look at the 4D complex numbers. It is interesting to compare the behavior of the average math professor to back in the time to Hamilton who found the 4D quaternions. All in all I have begun linking the 4D complex numbers more and more in the last 8 months. On details the 4D complex numbers are very different compared to 3D and say 5D complex numbers but there are always reasons for that. For example the number tau has an inverse in the space of 4D complex numbers but this is not the case in 3 or 5D complex numbers space. Well, have a nice Christmas & likely see you in the next year 2019. Using the Cayley-Hamilton theorem to find ‘all’ multiplications in 3D space. The supersized electron, can you accelerate one cubic cm of this stuff with a magnetic field? The Cayley-Hamilton theorem neglected for 25 years? What would a quantum measurement on Paul his IQ yield? On Schrödingers cat & an example known as the envelope problem. ReinkoVenema on Third post on the Schrödinger wave equation using 3D complex numbers for atomic & molecular orbitals.